Jane – I thought of this only today! I too inherited it from my mother and it was most definately a book of discovery, of tears and laughter. So lovely to hear such a similar experience. 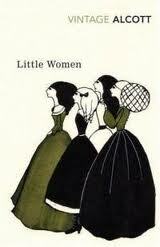 At the same time as ‘Little Women’ I also discovered Susan Coolidge ‘What Katy did’ and ‘What Katy did next’. These were Sunday School prizes and always the same publisher. Katy was of course an invalid for some of the book and this was quite romantic to me! The other books that come to mind from that same time are the ‘Anne of Greengables’ and ;pippy Longstocking’ – both strong, independent characters! So glad that this has made your list, Jane – absolutely one of my favourite books. And you’re right – it covers such a range of women, and shows women actually choosing their individuality- deciding and establishing who they are going to be, beyond just ‘female’. It made me think as well, of ‘The Little House on the Prairie’ – a book, actually a series of books, that would have to be on my list because – as you say – ‘Mum loved it’. She read them to me in bed, and I remember laughing and crying in equal amounts. Other than that, must-have books on my list would include some rather obvious choices – ‘Matilda’ by Roald Dahl, ‘Wuthering Heights’, ‘Madame Bovary’, ‘Pride and Prejudice – as well as ‘The Color Purple’ by Alice Walker, ‘Nights at the Circus’ by Anglea Carter’, ‘Good Morning, Midnight’ by Jean Rhys (in a sort of terrible, but necessary way) and ‘Trumpet’ by Jackie Kay really made me question my perspective on ‘gender’ as a concept when I read it at university. And a Shakespeare – ‘Romeo and Juliet’ or ‘Macbeth’? A hard choice, given the models of femininity they both provide! Reading Louisa May Alcott is a way of staying close to my mom even though she’s gone now. I inherited copies of Little Women, An Old-Fashioned Girl and Aunt Jo’s Scrapbag from her. I write about Louisa – come on over for a visit – http://louisamayalcottismypassion.wordpress.com – among other things I have the color plates from my 1920-something Old-Fashioned Girl in some of my posts.